Today begins a week of vacation/family reunion in Ohio... A trip that requires 8 hours in the air (ok, some of that is a layover), and I am currently hurtling above the earth at an alarming speed somewhere between Nashville and Columbus. But, what really prompted me to blog from 30,000 feet is this story. On the first leg of this journey - the almost 4 hour flight- I pulled out my thread and crochet hook, thinking that I might as well make some pebble sweaters. Although, I was not so silly as to bring a pile of pebbles with me, mind you. Seemed a little bit much, although the thought DID occur to me. So... I'm working on a pebble sweater, and Flight Attendant Julie stopped by with a, "Ooh! That's pretty! What are you making? 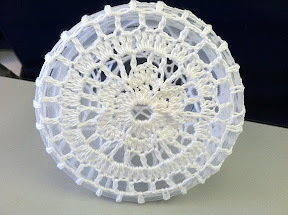 A doily?" I'm sure I blushed bright red, because it sure felt like it, as I was trying to figure out just how to phrase my reply so that I didn't sound like Miss Havisham or someone equally certifiable. I think I did say something like, "Well... I... ummm... I make little sweaters for pebbles, then I leave them on the beach for people to find..."
At which point she called over Andrew, Flight Attendant #2, and thus I was compelled to launch into a full-blown explanation. Julie is looking at me, smiling, half amused, half unsure if what I'm saying is true, so I fish into my bag and pull out one of business cards (no, TWO cards, because by this point, Andrew wants one, too). She is properly impressed. Andrew (who seems also to be duly impressed) says, "That's so Random!" in a very nice and lovely way, and, well, it IS, isn't it? Julie hints that, Gee! She sure would like to find a pebble like that! To which I sadly note that I didn't bring any pebbles with me... that I'm just making the crochet bits... and she giggles and tosses a bag of peanuts onto my tray and jokingly suggests I try making a sweater for that tiny bag of peanuts. It was a little too floppy... Not impossible, of course, but not the best of subjects. But it DID give me an idea. So I summon Andrew when her back was turned and asked him to bring me a clean cup, and told him that I was going to crochet a cover for it. I'm not sure he believed me. He doesn't know me like you guys do. 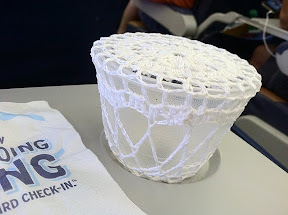 But I'm glad it was such a long flight, because I was able to finish the weirdest thing I've crocheted to date. And Julie couldn't believe that I'd done it. I do believe she said she loved it, in fact. And she was ever so sweet about it. 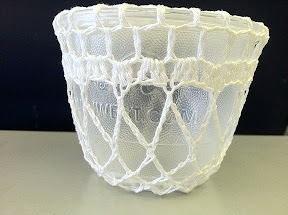 Kind of sad to put that much work into a plastic airlines cup. Not if it made someone happy.